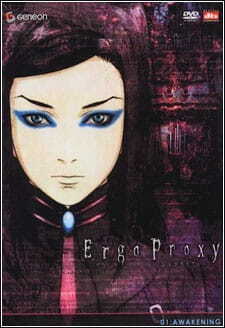 Just what is Ergo Proxy? Just simply put, it is a mystery, action-packed, sci-fi psychological thriller that would capture your attention right from the start. The world is not what it seems and the truth is more painful than the lie. Ergo Proxy is one confusing yet mind boggling story. You are set in a world where mankind are forced to live in isolated domed cities scattered everywhere due to the land being uninhabitable. Thus, people live "freely" in these domes. That is, their lives are pretty much controlled by the government. Assisting these people are autonomous robots called AutoReivs, and what shall happen to these AutoReivs comes as no surprise. Whenever there's an anime involving robots, there's bound to be a virus; and here we have the Cognito virus. It is up to Inspector Re-l Mayer to find out the truth of the Cognito virus. As she discovers more of the truth she accidentally encounters a Proxy. What are these Proxies and how are they related to the Cognito virus? That is what Re-l Mayer is determined to find out along with the mysterious Vincent Law. The story is intriguing and engaging but does leave some plot holes here and there. The main point sticks, so you won't feel helplessly lost. Some aspects were really well brought out, others were just confusing and mind boggling. In the end, it was interesting enough to keep going till to end. The art was perfect drawn for this anime. The use of heavy dark undertones and bland colour in the outside world really brings out a distinct contrast to the bright and colourful cities. We can instantly sense the sadness, desolation and destruction just by looking at the environmental of the outside world. Even the character themselves were detailed and showed a lot of emotions through the art style. This is one anime that really put effort in art detail to provide to subtly influence the audience's emotions to really get captivate in the story. The theme songs were appropriate to the anime and the voice acting was perfect for the characters. The vast desolate plains of the outside world are accompanied by various ambient music and the action scenes with fast-paced scores. This music is well composed for this anime. The characters are all a mystery in this anime until the very end where everything is revealed. However, along the way you probably can slightly guess which characters are who they seem to be. Re-l Mayer is probably one of the most interesting protagonists out there with a sense of Gothic style clothes and think blue eye-liner. Slightly creepy or what? Anyhow, you eventually get used to her as her personality changes for the better because of Vincent Law, whom she hates and loves at the same time. Just who is Vincent Law? I'm not spoiling anything here. Lets just say he is a man of mystery and that the whole story pretty much revolves around this guy. Enough said about him, the rest of the characters just play a minor role in the whole story whether to help or hinder the duo as they quest to find out the truth of the world and about the Proxies. Overall, it was one compelling story about the fictitious world as we know it. The post-apocalyptic environment containing interesting characters along with a thrilling story is just plain enjoyable to watch. Although there were some plot holes in the story along with some unanswered questions, it was still a entertaining anime to watch. If you are into psychological sci-fi then this is definitely for you. Interesting from start to finish although there are some plot holes and unanswered questions. Just well designed and appropriate for the anime. The huge contrast between the 'inside' and 'outside' is just amazingly differential and influential to the audience. Voice acting was of high quality along with nice theme songs and various sound effects. Mysterious characters are the main focus of this anime. Mystery + sci-fi = a pretty decent anime to watch and Ergo Proxy does provide. Entertaining and engaging to the very end. There were a couple of fillers but nothing too drastic to break the rhythm that this anime has built up. Kairosoft, just take my money and go!